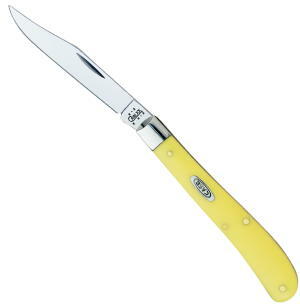 Case 31048-CV Single Blade Utility knife pattern with yellow synthetic handles. 4-1/8" closed length with one chrome vanadium steel blade. Made in U.S.A. Box Size: 4-1/2" X 1-11/16" X 3/4"
Knife Handle 5/16 in. 1 in. Knife Blade 1/4 in. 1-1/2 in.